MANCHESTER, England—Steven Gerrard gave Liverpool a 1-0 win over a lackluster Manchester City on Wednesday in the first leg of their League Cup semifinal before being involved in an angry tunnel exchange with home manager Roberto Mancini. The pair clashed twice with Gerrard annoyed at Mancini's response to a two-footed tackle by Liverpool defender Glen Johnson on Joleon Lescott late in the game. Still annoyed at the four-match ban City captain Vincent Kompany must serve following his dismissal against Manchester United on Sunday, Mancini felt an even greater sense of injustice on Wednesday. "This (Johnson) tackle was worse," Mancini said. "Gerrard came to me and said I said something. It was not for Johnson. It is for the tackle. This tackle was worse than Vinny's. Everyone can see it." The incident completed a bad night for Mancini and his City side, which slumped to back-to-back home losses for the first time since February 2008. City looked lethargic throughout the first half and then failed to convert a number of chances in the second, three days after seeing its FA Cup defense ended by United. Gerrard slotted his spot kick into the bottom right corner and out of reach of goalkeeper Joe Hart in the 13th minute after Stefan Savic had fouled Daniel Agger in the area. City, which leads the Premier League by three points ahead of United and Tottenham — which beat Everton 2-0 in Wednesday's only other game in English football — struggled to make up for the absence of several key players against Liverpool. While Kompany is banned, Kolo Toure is on African Cup of Nations duty with the Ivory Coast and Mario Balotelli was substituted in the first half with an ankle problem. "It is clear that without three or four players it's more difficult but in the end we didn't deserve to lose the game," Mancini said. "We played poorly in the first half but the result is not right. The right result was a draw." Kompany's stand-in, Stefan Savic, had a particularly difficult time, struggling to contain Liverpool forward Andy Carroll and conceding the penalty. "Savic needs to get experience," Mancini said. "It is normal. He is young. Against a striker like Carroll maybe he could have some difficulties. But in the second half it went better." Liverpool started strongly, and Hart had already been forced to make three good saves to keep the game scoreless before Gerrard's penalty. 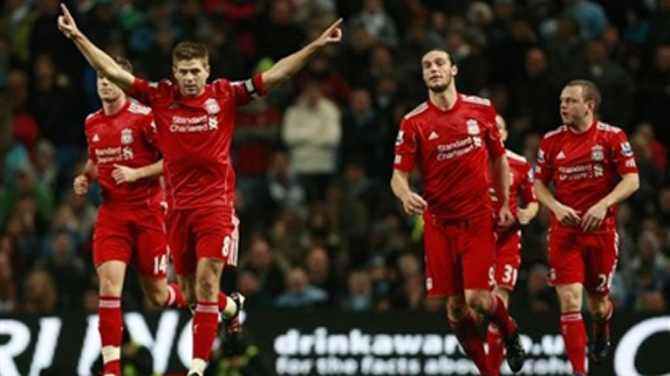 "There were two different performances in each half," Liverpool manager Kenny Dalglish said. "(In the) first half we looked a little more threatening but in the second half, having got the goal advantage, we battened down the hatches and tried to get through it with no goals against us. "Not too many teams have come here and gone away with no goals against them." City's performance improved after Balotelli was taken off and replaced by Samir Nasri, but the former Arsenal midfielder was denied by Pepe Reina with a shot from just outside the area. Sergio Aguero had City's best chance to equalize in the second half, as he pounced on a poor back pass in the area and rounded Reina, but he couldn't get his effort on target from a tight angle as the goalkeeper kept up the pressure by diving at his feet. Aguero had another chance in the 66th when he ran into the area, but curled a weak shot at Reina that caused no problems for the keeper. Reina was also in the right place to deny Micah Richards' close-range header after the stand-in City skipper had met Nasri's corner. "We might have the slight advantage with the goal but it does not mean to say there will be anyone jumping through hoops at our place — we will just go and be professional in the second leg," Dalglish said. "We have to be happy but we are not presuming that the job is done." In the other semifinal, Crystal Palace beat Cardiff 1-0 at home on Tuesday.